Extremely safe, manual desk-top office guillotine with "fast flick" action clamp. The EBA 4300 is ideal for a small office environment, copy shops and print shops. 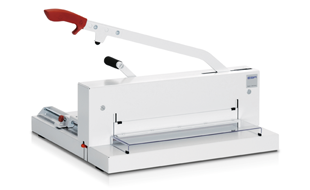 Designed for ease of operation, this entry model guillotine offers a high cutting performance, numerous safety features and the convenience of fitting into small spaces. Interested in the EBA 4300? Contact us to see how this Manual Guillotine can help your business!